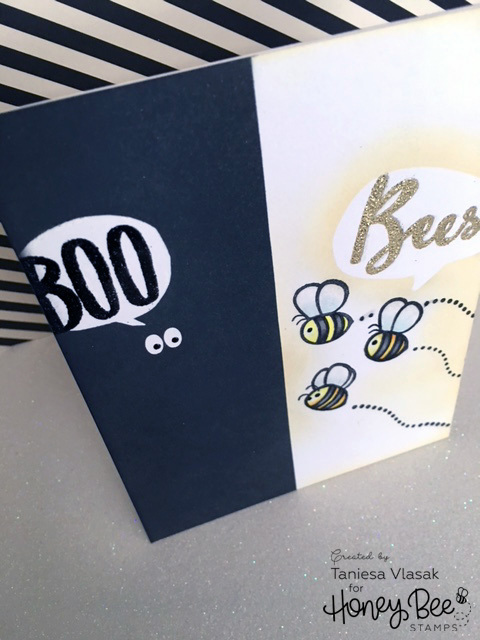 Stopping in to share a super fast Halloween card that is sure to get a few giggles! 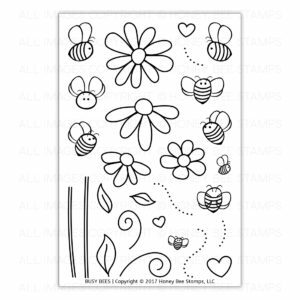 The Honey Bee Stamp set that I am using today is the Busy Bee’s Stamp set. Disclaimer: Affiliate links are used in this post at no additional cost to you, Thank you for supporting my blog! Here is a close up look at today’s card. This is a one layer card. To get the speech bubbles on either side of the card as well as the eyes, I used paper punches and masking paper. First I masked off the bee’s side and pressed the masks down where I would want them. Then I took Black Soot Distress Oxide ink and with a blending tool covered that section of the card completely. I did one full layer (then had to run one of the kids to their activity) then did a second layer. I noticed I got a really nice coverage this way. I colored in my little bees with some copics in shades of Yellow and Neutral greys for the black of the bees. I used a little BG11 (Moon White) for the bottom of the wings and then coated all of the wings with the Nuvo Clear Glitter Gloss brush pen. This gave a subtle shimmer. I placed the speech bubble mask down above the bees and with a finger dabber went around the bubble as well as around the white areas around the bees and card with the lightest shade in THIS ink pad (Ombre butter to orange by Hero Arts) Then I removed the mask and I stamped the word Bee from the Bee-YOU-Tiful stamp set using Nuvo Clear ink. To get the S i took THIS embossing pen and connected the S freehand. I embossed this with the Nuvo Gold Enchantment embossing powder. On the other side I stamped the BOO using the Hand lettered alpha in the same clear ink and embossed with WOW black glint glitter embossing powder. I found that I got a few spots of stray embossing powder and a ink smudge. Rather than start the card over again I lightly sanded those spots using this Tombow Sanding Eraser and then if there were any marks leftover I covered it with my white gel pen. That’s it. This card is super simple and comes together in less than 10 minutes! I think it would be a fun card to use for breast cancer awareness month as well! 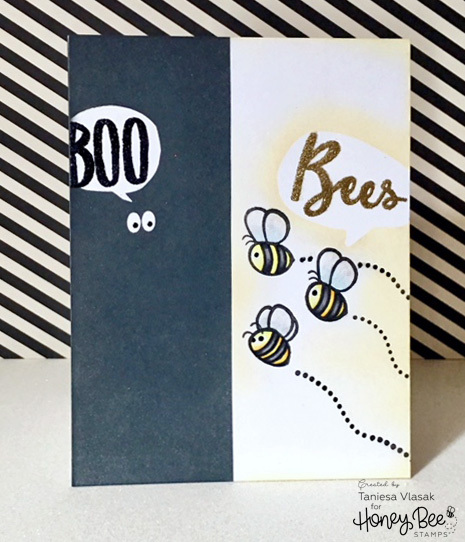 I hope I was able to inspire you and give you a little giggle with my Boo Bees card today! Mixing it up! Honey Bee Stamps and Essentials By Ellen! Today I am mixing it up on the Ellen Hutson Blog as well as the Honey Bee Stamps Blog with some beautiful stamps and dies from both companies! For this card I am using the Bokeh Dots and Thankful stamps by Essentials By Ellen and the Kindness stamps and Kindness dies from Honey Bee Stamps. I wanted to do a one layer card and keep things pretty simple so I decided to do some masking and embossing. I will never get tired of the impressive results of masking and the elegant touch of some gold embossing powder. When creating several masks of the same image I like to double up on my masking paper and cut once. I stamped all of my images out on Eclipse masking paper and then adhered that piece on top of another piece of masking paper and then cut out. This saves time and if your cutting masks anyway you could always cut some for the next time! I started out with some Neenah Desert storm cardstock cut to 5.5″ x 4.25″(I later trimmed this down slightly smaller to show the polka dot pattern) I stamped and embossed the large kindness sentiment and then masked and stamped the various images from the Thankful stamp set and the smaller sentiments from the kindness stamp set. I used versamark ink for the embossed sentiment and I used Versafine Vintage Sepia for the small sentiments and other images. The dark brown ink goes so well with the Desert Storm cardstock and was less harsh of a line than the Versafine Onyx black that I usually use. Finally I stamped the scattered dots from the Essentials by Ellen Bokeh stamp set with some Delicata Golden glitz ink. After all that I was able to remove my layers of masking paper to reveal the finished stamped design! I love this part! I then colored all of the images in with my Faber-Castell Polychromos pencils. These blend beautifully on this cardstock! The only time that I used my gamsol blending medium was around the Kindness sentiment, to add a shadow. I found that after I colored the images the brown lines became lighter and darker in spots. If I stamped over the images again the ink would not cover evenly because of the oil based pencil. So I took a matching colored pencil and went over all of the brown lines. (see photo below for comparison) This gave the image a cohesive look and evened out the color all the way around. What a big difference, right? The color I used to match up with the Vintage Sepia colored in was the 9201 Polychromos Burnt Umber. I think that doing this made the images feel like one big stamp instead of several little stamps. I did find that the Kindness sentiment got a little lost after all was done. To fix this I die cut the Kindness sentiment out using the dies by Honey Bee stamps. The die and the stamp are exactly the same size so I embossed the die with the same pale rich gold embossing powder and then adhered the die cut on top of the stamped image with Ranger Multi Medium Matte. Before I glued the die cut down I did shade with the same burnt umber pencil I was using, around the kindness sentiment… I blended that out lightly with some gamsol and a paper blending stump. I thought this gave just a bit more pop to the card. I added the card panel to a piece of gold and brown polka dot paper from Echo Park and then glued that to a A-2 card base made from the same Neenah Desert Storm cardstock. I really enjoyed coloring this card. I need to give my colored pencils some more love. I was pleasantly surprised how bright the colors showed on the kraft colored cardstock. Head on over to the Honey Bee Stamps blog and the Ellen Hutson Blog for more inspiration and a chance to win a great prize! I started out buying the pencils open stock, However if I had to do it all over again I would have got the full set because it saves in the long run, especially when on sale! Ranger Multi Medium, Matte Mini, 1/2 oz. Quilled Creations Precision Tip Glue Applicator Bottle 0.5 oz. Thank you so much for stopping by! Check back next week for some fun new surprises! 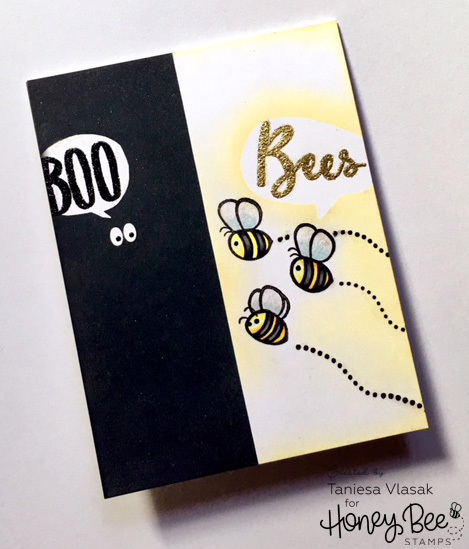 Misti and Honey Bee Stamps | A perfect match! Happy Friday! Let's get ORGANIZED! Christ has set me FREE |Journaling bible entry. Finally found a Washi storage system that works! Trinity Stamp's Winter Release is here! I've got Sunshine on a Cloudy Day.... Honey Bee Stamps and Ellen Hutson BLOG HOP!